The Association ot Train Operating Companies has announced that all its franchisees will be able to take orders from train travellers straight from their phone and receive their tickets literally seconds before trains depart. The system uses Masabi's tried and tested mobile ticketing solutions which relies on a barcode image that is scanned by the appropriate device(s) - as used by City AM newspaper and for V-fest events. There's no need to sign-up and fast repeat purchases can simply be done using the card's CVV. In addition, you won't be charged extra for using the sytem which uses US Government certified security encryption and when things go wrong, the new barcodes contain enough ticket information to allow alternative systems to validate tickets. Ben Wittaker of Masabi said that "Once you send your text message to purchase your ticket, you will receive a response with a barcode reference, which can be scanned by inspectors." Commentators hope that the service is more reliable than the UK train network and more secure than Transport For London's own Oyster system which has suffered a number of security scares in the past few months. National Express, Heathrow Express and Chiltern Railways have already adopted the Rail Settlement Plan. This will lay the foundations of the rail ticketing body in charge of drafting the UK-wide standard which will oversee the use of tickets printed outside train stations. 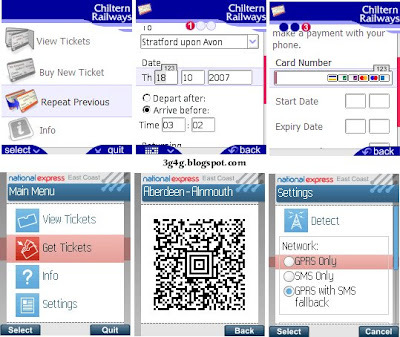 Following successful trails with various train companies Masabi has worked with the Rail Settlement plan - the body that cross charges networks for ticketing to create an open standard for train tickets carrying bar codes to be accepted across rail franchises - enabling tickets to be printed out at home, or even displayed on mobile-phone screens, and used on journeys between network operators. Selling tickets is an expensive part of running a rail franchise, and nearly 90 per cent of tickets are still sold at stations using ticket machines or at traditional windows. Trials run by Masabi, who specialise in rendering bar-code information on phone screens, have apparently demonstrated that customers will happily buy tickets using their mobile phone - either while travelling to, or on arrival at, the railway station. Masabi's Java application stores the customer's credit card details locally, so the user just keys in the three-digit code from the back of their card along with origin and destination, and the ticket is bought and delivered over SMS or data connection where available. But the standard also allows for bar codes to be rendered on other devices, or printed out after being bought on-line. Ticket inspectors will need to be equipped with bar-code readers, of course, but many are already sporting the technology and the standard has been devised in such a way that the last eight digits can be manually entered and checked on-line if necessary. Where a bar-code reader is used it shouldn't be necessary to perform an on-line verification as the 2D bar code contains authenticated details of the journey paid for. The service does open up the opportunity to have one's phone poised, ready to buy a ticket should an inspector turn up, but you'll have to ensure you're are in the middle of a long carriage for that plan - as being dependent on timely SMS delivery to avoid a fine is not a good position to be in. See Masabi's website for details. 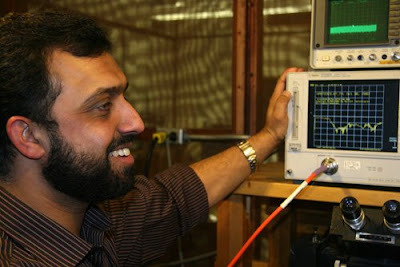 ­Atif Shamim, an electronics PhD student at Carleton University, has built a prototype that extends the battery life of mobile phones, by getting rid of all the wires used to connect the electronic circuits with the antenna. The invention involves a packaging technique to connect the antenna with the circuits via a wireless connection between a micro-antenna embedded within the circuits on the chip. “This has not been tried before - that the circuits are connected to the antenna wirelessly. They’ve been connected through wires and a bunch of other components. That’s where the power gets lost,” Mr. Shamim said. He estimates his module consumes 12 times less power than the traditional, wired-transmitter module. It is also much simpler in design, lowering the overall cost of any hand-held device, he said. Mr. Shamim has filed patent applications in the U.S. and in Canada. Earlier this year, the Ottawa Centre for Research and Innovation honoured Mr. Shamim and Mr. Arsalan as student researchers of the year for their work in the field of wireless biomedical sensors. Shamim says his major goals for the innovation still lie in biomedical applications, including his original radiation sensors as well as remote healthcare sensors to monitor heart-rate, blood pressure and body temperature. He and Arsalan have also started up a company called Vital Signs Monitoring, and the two have already filed patents for the technology they developed. Clearly he has come a long way from when he first came to Canada, but he says his goals are still the same. "My aim when I came here was to get some real skills in this domain, learn some new things and be an expert of something that would be valuable for me to find employment," said Shamim. "I was looking for a neat application for these small transmitters. ...That's where the trend is: make it cheaper, smaller, more efficient, so I think this is a good step towards that." The volume of U.S. wireless subscribers who accessed social networks via mobile handset increased 182 percent between September 2007 and October 2008 according to a recent consumer study conducted by research firms The Kelsey Group and ConStat--in all, about 9.6 percent of U.S. subscribers ages 18 and over connected with a social network via mobile handset during the past year, compared to just 3.4 percent 12 months earlier. A separate user study released this fall by market analysis firm ABI Research reports close to half of all social networking users have now visited destinations like MySpace and Facebook via mobile device. Forty-six percent of social network members have visited their favorite sites on their phones, with more than half of them checking for comments and messages from their friends--about 45 percent have also posted status updates. ABI adds that among all mobile social networking users, nearly 70 percent have visited MySpace, with another 67 percent checking their Facebook accounts. No other social networking destination achieved 15 percent mobile adoption. ABI suggests that consumers do not wish to create new and separate social networking profiles for the mobile platform, but instead prefer to access their existing social networking accounts on the go. Both Facebook and MySpace enjoyed banner years in mobile. In November, Facebook announced its mobile userbase has expanded from 5 million to 15 million since the beginning of 2008--writing on The Facebook Blog, mobile team engineer Wayne Chang adds that in the 24 hours after the site began allowing subscribers to comment on their friends' status updates via the Facebook mobile site, users posted close to a million status comments. No less impressive, MySpace announced that same month that its integrated mobile solution customized for device maker Research In Motion's BlackBerry smartphones generated more than 400,000 downloads in its first seven days of release, an all-time high for both MySpace and RIM in terms of first-week downloads. 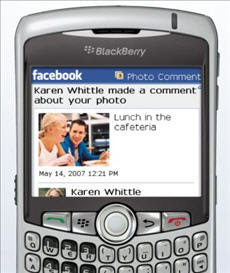 Perhaps most important, the success of the BlackBerry MySpace app underscores social networking's growing profile among enterprise users--for many smartphone-toting professionals, 2008 was the year they abandoned their Rolodexes in favor of making and nurturing their contacts via the virtual world. I can relate to this as mobile is now the main source of internet connectivity for my wife. I have been asked to get the new INQ1 phone from '3' as it would make her experience of Facebook better. 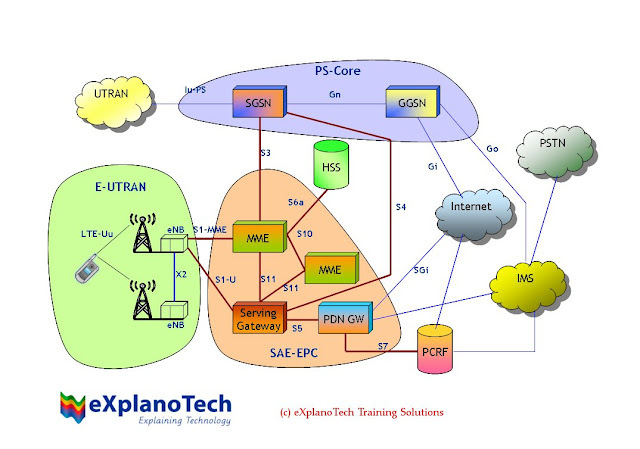 Here is simplified diagram of LTE Interfaces from my upcoming training on LTE/SAE. Hope you find it useful. It is widely accepted that the deployment of femtocells will be a significant factor in driving the future uptake of mobile broadband services. There has been concern however over potential issues of interference between femtocells and the micro/macro networks. These concerns have been largely allayed by a femtocell radio study carried out by The Femto Forum. If one understand the basic concept of femtocells that the concern for interference is obvious. The femtocells and macrocell network share the same carrier and hence the cause for interference. The simplest way to avoid interference is for the femtocell to utilise a different carrier than the surrounding macro network. But I think this will be like running away from the problem instead of solving it. Also this not very much feasible or practical solution either because majority of 3G operators do not have sufficient spectrum. This issue was really serious and as expected whoever involved with the femtocell deployment specially the Femto Forum got involved into the research to answers the queries regarding the interference. The Femto Forum study therefore focused on finding technological solutions for mitigating interference when both the femtocell and macrocell networks share the same carrier. These methods are already being developed for pre-standard femtocell solutions, and Femto Forum members are working to bring them within the standards framework. The main objective of the study was to identify a number of solutions that will mitigate any potential interference of the macro network by the femtocells. The first really good news is that the study found femtocells have the potential to deliver an order of magnitude of more capacity than the macro network alone when used in dense deployments, even when occupying the same radio channel as the macrocell. Effectively what it’s been suggested is that any interference related barriers to wide scale femtocell deployment have been removed so operators will be able to maximise the capacity benefits offered by femtocells. Adaptive Pilot Power Control: In this case the femtocell dynamicallyadjusts its transmit power in response to the current level of signals fromsurrounding cells and the desired coverage area. Extended Tests for Dynamic Range: This will ensure that femtocell designsare able to operate reliably even in the presence of nearby high powermobile phones connected to the macro network (this test has already beenincorporated into the latest 3GPP Release 8, 25.104 specification). Uplink power capping: This technique specify that the uplink power of the mobile phone is capped when operating in the femtocell environment thus ensuring that even in difficult radio conditions,the phone hands-off to the macro network before its transmit power increasesto the point where macro noise rise is a problem. Dynamic receiver gain management: Automatic gain or adaptive attenuation in the femtocell will ensure that femtocells can offer good service to both near and far mobile phones without unnecessarily increasing the phone transmit power, therefore keeping the noise rise to a minimum. At a time when mobile operators are seeing data usage rocket, femtocells offer an economic and effective way to deal with demand. This therefore makes it very important for the femtocell technology to sort out any niggling issues. There is no doubt that by utilizing the identified interference management techniques femtocells can offer operators an effective method to increase capacity and coverage within theirexisting networks through dense cell deployments. In the last year alone femtocells has come a long way and as we speak the technology is in the process of getting deployed at many places. There is no doubt that mobile operators have moved from laboratory tests and technical trials to large-scale commercial pilots of femtocells. The most public of these has been Softbank Mobile in Japan that is using around 10,000 femtocells to test the technical and commercial feasibility of the technology. There are so many multinational operators who are conducting trials as above with the objective of launching commercial pilots during Q1/2009. However this opportunity is reliant upon mobile operators developing and marketing a proposition that will have obvious appeal to the consumer. Even now in some countries the mobile operators struggle to understand what femtocell proposition will work in their market? They understand the business case, but the key issue of how to persuade a customer to acquire and install a femtocell remains unsolved in many regions. This could be explained best by taking the example of Germany where cellphone subscribers are accustomed to using advantageous 'home-zone' tariffs that use the normal cellular network to determine when the subscriber is making calls from their home. Attempting to undermine this attractive proposition with a femtocell-based solution could be difficult. However places where comprehensive 3G coverage is compromised it is possibly providing the subscriber with their own femtocell, or personal 'home cell which could eventually prove to be particularly attractive for the customer. I believe the key challenge is the consumer proposition and the future success depends on mobile operators and their ability to package their femtocell propositions appropriately for the various market segments. I always ask the question whether standalone femtocells are likely to be short-lived. ip.access claims it is already seeing demand for femtocell modules to be integrated into other devices, such as WiFi home hubs and set-top boxes, etc. Moving aggresively into the direction of making the femtocell technology a real success, major global operators are now backing the vision of taking femtocells out of homes and offices into the wider environment as part of their Long Term Evolution (LTE) deployment. I think this is a smart move as you cannot be relying completely on the “home only” concept to move femtocells in the vicinity of huge success. At the LTE World Summit in London, China Mobile, T-Mobile and Telus all expressed support for this idea that first was advanced by Vodafone earlier this year. Femtocell specialist picoChip gave reality to this concept by announcing further details of what is claimed to be the industry's first complete LTE picocell and femtocell reference designs. These new platforms will enable high capacity networks for metro, hot-zone and rural deployments. According to the picoChip view of LTE, all deployments will consist of small femtocell base stations. I hope you agree that with femtocell technology reaching commercial maturity, attention is now switching to developing application services and operator business models that will maximize the technology benefits which will eventually lead to a success story for femtocells. So here comes 3G in India. It’s been long coming as the data needs were increasing rapidly in almost all the Indian states. With the existing cellular infrastructure not capable of holding huge traffic particular for data, arrival of 3G was imminent. The Indian Department of Telecoms (DoT) has published its official timetable for the award of its 3G licences across the country as well as a breakdown of how the relevant spectrum will be allocated across the telecoms circles. As expected, the state-owned operators BSNL and MTNL each have been reserved one block of 2x5MHz in each circle, with the exception of Rajasthan (State in North West India) which will have no 3G spectrum at all. The number of blocks of spectrum in the private auction differs depending on the circle (see the spectrum table, below). The auction for the 15-year licences is planned for Jan. 15, 2009. In the majority of 3G service areas there is 25 MHz of paired frequency bandwidth available which relates to four blocks of 2x5 MHz spectrum available for auction in addition to the block reserved for the state-owned operators, Bharat Sanchar Nigam (BSNL) and Mahanagar Telephone Nigam (MTNL). Spectrum is rather limited in many other areas, including the major metro circle of Delhi where only two 2x5MHz blocks will be available to private operators. All of the 3G spectrum will be in the 2.1 GHz band and in the 2.3 GHz and 2.5 GHz frequency bands, a separate auction for Broadband Wireless Access (WiMAX). In both these auctions, which will take place two days after the 3G auction, bidders are restricted to just one block of spectrum per service area. The table below shows the proposed spectrum layout. BMI is piloting mobile internet and texting services on planes, but frequent flyers need not get up in arms about getting stuck next to chatty people, as the airline has wisely chosen to leave out voice calls. The service, from OnAir, will be trialled for six months on just one plane – an Airbus A320, which flies between Heathrow and Moscow. Passengers will be able to use SMS, email and internet on mobiles, PDAs and laptops with GSM SIM cards or dongles. Peter Spencer, managing director of BMI, said: “It opens up an exciting new era of travellers being able to stay in touch by text message and email whilst in the air. The pilot project isn’t just about testing the tech or the take-up, however. “The trial will help us address some of the social and etiquette issues regarding the use of mobile communications devices inflight and provide valuable customer feedback which will be at the heart of deciding how the service is developed and rolled out across the remainder of our mid haul fleet,” Spencer said. “We have chosen not to implement the voice call option as part of the trial,” he added. On the other side of the world, Delta Air Lines officially launched Aircell's Gogo Inflight Internet service on six of its aircrafts. In-flight Internet initially will be available on five MD-88 aircraft flying Delta Shuttle routes between New York's LaGuardia Airport and Boston's Logan and Washington's Reagan airports plus one Boeing 757 flying throughout Delta's domestic system, with service spreading to other Delta routes as additional aircraft are introduced. "In-flight Internet access is one of the most popular requests we receive from our customers," noted Tim Mapes, Delta's senior vice president of marketing. To celebrate the launch, Delta passengers traveling on the Gogo-equipped MD-88 Shuttle aircraft will be treated to a holiday surprise with complimentary access to Gogo during a Dec. 16 - 31, 2008 promotional period. A "WiFi hotspot" decal will be prominently displayed adjacent to the boarding door of the MD-88 aircraft so customers will know Gogo Inflight Internet service is available on their flight. In addition, a Delta-Gogo instructional card will be available in each seatback, providing details on how to sign up for the service. Gogo representatives and Delta employees will be available at all three Delta Shuttle-served airports throughout the promotional period to provide information and assistance to customers traveling during this timeframe. The World Economic Forum on Thursday named Japan-based Mobile Healthcare Inc (MHC) as a 2009 Technology Pioneer. The company, which develops real-time mobile health solutions for preventing and managing diabetes, obesity and other lifestyle-related illnesses that can be accessed over mobile phones, became one of the 34 technology visionaries to be honored at the 2009 World Economic Forum. The company’s flagship product, Lifewatcher, is a mobile phone-based health management application for people with so-called ‘lifestyle diseases’ such as diabetes and obesity. Users can monitor their own conditions by logging blood sugar levels, calorie intake, exercise and many other variables into their ‘always on’ mobile device, creating a one-glance health portfolio, which collates daily, monthly and even yearly data. It also delivers vital medical information, reminders and alerts with escalating alarm-levels if goals are not met.Using real-time cellular technology, diabetics and lifestyle illness sufferers can also be in constant dialogue with medical practitioners to ensure health measures are in check or, if not, to spark intervention that could save lives. With the dramatic rise of diabetes and obesity to pandemic levels in countries like Japan and the U.S., doctors have been welcoming this self-directed management tool that affordably and easily increases drug, nutrition, exercise and monitoring compliance for sufferers. With the telecoms market so tight every company especially the giants like Nokia are looking at the alternatives for their revenues to go further north. Some time ago there was a rumour that the Nokia might enter into the laptop market and hence widen its area of business. Although at that time this was categorically denied by Nokia, rumours the Finnish mobile giant may be planning to enter the laptop computer market have resurfaced. On this occasion it was through the medium of a research note from a Union Bank of Switzerland (UBS) analyst. For a report that could just be speculative it contained a remarkable amount of detail suggesting as it did that the Nokia device would be a 9 to 10 inch notebook/tablet computer with touchpad, NFC and Linux OS. In its early days Nokia did produce computers but by the mid-1980s it had exited the business, merging its PC division with Ericsson Information Systems. In the past of couple of years we have seen that companies like HP and Apple have moved into the smartphone business and hence taken a small share of the market. 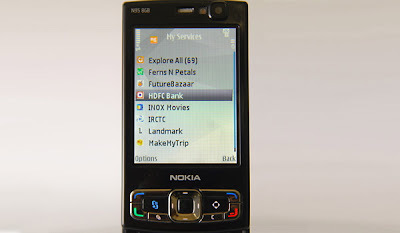 This has really affected likes of Nokia, Ericsson, Samsung and other vendors. Taking a leaf out of computer manufacturers such as HP and Apple who has moved into smartphone business, Nokia thinks that perhaps it is its time now to mount a counterattack. JiGrahak is behind ngpay, the brand name of a free mobile-commerce service that allows consumers in India to shop, order meals, make charitable donations, do their banking, and pay their bills, among other things. Launched last February, ngpay already has attracted more than 230,000 users and has become the largest channel for mobile-based transactions with Indian Railways and HDFC Bank, and for movie ticketing. The company expects to have 1 million users by mid-2009. 3GPP TR 25.820 - 3G Home NodeB Study Item Technical Report: Contains study of items from RAN#2, RAN#3 and RAN#4 point of view. 3GPP TS TS 22.220 - Service Requirements for Home NodeBs and Home eNodeBs: It lists different requirements as the title suggests. You can see some more info on this at Martin's blog. Over the next few months since the Femtocell race is heating up, you would find these documents being updated with lots of details and probably stage 2 and stage 3 documents detailing some implementation details, etc. Will keep you informed. There are so many telecoms blogs which we read and write in our daily life. 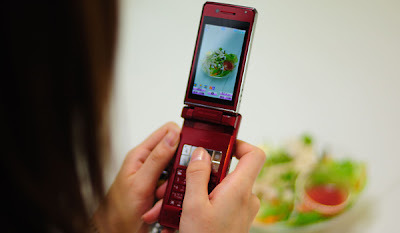 Today I want to touch on a different but very serious subject regarding the mobile phones. Everybody knows how dangerous or distracting a mobile phone can be when we are involved in some other jobs e.g. driving. I thought to touch on this subject and outline some important facts about the do’s and don’ts before we go into the festive period. It’s very much evident that while driving it’s simply dangerous to chat on the mobile phone. It doesn't matter much whether the talking happens with a phone held to the ear, or through a speaker-phone, it's all distracting to the driver. In the past, it has been reported that chatting on mobile phones slows traffic. It’s quite simple that drivers who are talking on a cell phone clog traffic because they're driving more slowly (and reacting much more slowly) than drivers who take the radical path of paying attention to their driving. Well, yet another study, this time conducted by researchers at the University of Utah, finds that mobile phone calls are just plain distracting to drivers (must read this article). Admittedly, the sample size consist only 41 adults, with 41 of their passenger friends. What is interesting about this study though is that it pits drivers having conversations using hands-free mobile phones against drivers maintaining in-car conversations with their passengers. The study noted that drivers on their mobile phones tended to drift in their lanes, and were four times as likely to miss pulling off the highway at a prearranged location. Drivers maintaining conversation with their passengers apparently fared much better. A plausible reason for this is that the in-car passengers actually supported drivers by their talking about surrounding traffic. Last week in one of my blog I reported how texting is picking up especially in teens. Texting on the mobile is even more dangerous than chatting while driving as your eyes are down. In September this year a train crash was reported in California where the driver was blamed for the crash as he was busy texting. Well this was for the drivers but how about normal person on the road. Everyday we come across people who walk across the street looking at their cell phone and not at the traffic. This business of walking with you eyes down on the cell phone is equally a risky business as it is while driving. Well I know that there is nothing new in whatever I mentioned above and it has already been told to us millions of time. I still considered myself a duty bound and thought if I mention here soma of you may be extra cautious while using the cell phone specially when during this festive period. Please take care and I wish you wonderful Christmas and Happy New Year. Vodafone launched a pay as you go USB modem that doesn't need topping up every month. It costs £39 upfront and comes with £15 worth of credit, which amounts to 1GB of data. According to Vodafone, 1GB of data lets you do 30 hours of Web surfing, or send 650 emails, or download 65 music tracks or short video clips. Unlike certain other pay as you go mobile broadband services, the 1GB will not expire after 30 days. The minimum you can top up the dongle each time is £15, which can be done using a voucher or over the phone. It is capable of speeds of up to 3.6Mbps, but customers should only expect speeds of up to 1Mbps to 2Mbps. The modem will also double as a 4GB USB memory stick. I would like to refer to this as true pay as you go plan because the topup does not expire after a month. On the other hand, a similar amount on '3' would get you 3GB of data in their version of PAYG which expires after a month. According to 3GPP website: 3GPP has approved the functional freeze of LTE as part of Release 8. There is significant commitment from operators to deploy this technology, and this landmark achievement will allow them to realize their early deployment plans. But the 3GPP decided to give more time to the work on SAE -– a.k.a. evolved packet core (EPC) –- because the specs weren't complete enough. The standards body has drawn up a list of "exceptions" that will have until March 2009 to be finalized in order to be included in Release 8. "There are a number of pieces of work which we thought should be included but weren't quite ready," says Scrase. "[There are] quite a number of parts for SAE, the work [on which] still lags behind LTE work. We have a high level of confidence that the items will be completed by March, otherwise we wouldn't have included them on the list." Scrase says that it is common to extend deadlines in this way and that the 3GPP allowed a similar extension for Release 7. The decisions about LTE and SAE took place at a 3GPP meeting in Athens last week, where the group definitively agreed on what is contained in Release 8 and what's not, according to Scrase. The group also agreed on what should be included in Release 9, which is scheduled to be frozen in December 2009. And there is more to Release 8 than LTE and SAE. For example, some of the specifications for femtocells -- or "Home Node B" in 3GPP terminology -- are included in the release. As the competition is spicing up for the LTE race, companies have now started to launch their LTE products. Continuing with the trends and keep the competition alive it’s now Aeroflex which launched the TM500 TD-LTE test mobile. This latest LTE test mobile is designed to support Time Division Duplex for 3G LTE (TD-LTE) and will definitely compliment Aeroflex's TM500 LTE-FDD for 3G LTE Frequency Division Duplex quite well. Ever since China mobile announced its plans for TD-LTE there was immense pressure on the equipment vendors to meet the demands. TM500 TD-LTE test mobile is designed to enable infrastructure equipment vendor’s match that demanding timescales for TD-LTE trials in China. The TM500 TD-LTE's extensive Layer 1, Layer 2 and higher layer test features make it an indispensable testing peer that provides complete visibility even into the lowest layers of the radio modem by generating the detailed diagnostic data needed for engineers to verify the required functionality and optimize network operation and performance. All the above characteristics if the test mobile will enable comprehensive development and test support of base station and network infrastructure for the next generation of Chinese mobile technology. The TM500 TD-LTE can co-exist in the same unit as the TM500 LTE-FDD protecting investment and maximizing test flexibility for engineers working on both standards. Aeroflex will provide full in-country support for the TM500 TD-LTE so that technical questions and integration issues can be dealt with in Chinese and Aeroflex engineers can get on-site quickly, if needed, without having to fly in from Europe or the USA. The TM500 TD-LTE will be available for customer shipment in late 2008. It will be available both as a standalone unit and as an upgrade to existing TM500 LTE-FDD systems. Background: The current US military satellite communications network represents decades-old technology. To meet the heightened demands of national security in the coming years, newer and more powerful systems are being developed. Advances in information technology are fundamentally changing the way military conflicts are resolved. The ability to transmit detailed information quickly and reliably to and from all parts of the globe will help streamline military command and control and ensure information superiority, enabling faster deployment of highly mobile forces capable of adapting quickly to changing conditions in the field. Satellite communications play a pivotal role in providing the interoperable, robust, "network-centric" communications needed for future operations. Military satellite communications (or milsatcom) systems are typically categorized as wideband, protected, or narrowband. Wideband systems emphasize high capacity. Protected systems stress antijam features, covertness, and nuclear survivability. Narrowband systems emphasize support to users who need voice or low-data-rate communications and who also may be mobile or otherwise disadvantaged (because of limited terminal capability, antenna size, environment, etc.). Lockheed Martin Space Systems, Hughes Space and Communications and TRW have formed a National Team to build the Department of Defense's (DOD) next generation of highly secure communication satellites known as the Advanced Extremely High Frequency (AEHF) system. The Advanced EHF programme provides the follow-on capability to the Milstar satellite programme. It provides the basis for the next generation military communications satellite system, for survivable, jam-resistant, worldwide, secure, communications for the strategic and tactical warfighter. The system replenishes the Milstar constellation in the EHF band. Each of these Advanced EHF satellites employs more than 50 communications channels via multiple, simultaneous downlinks. Launch of the first AEHF satellite is planned for April 2008 with the second AEHF satellite scheduled for launch in April 2009. The fully operational Advanced EHF constellation will consist of four crosslinked satellites, providing coverage of the Earth from 65° north latitude to 65° south. These satellites will provide more data throughput capability and coverage flexibility to regional and global military operations than ever before. The fifth satellite built could be used as a spare or launched to provide additional capability to the envisioned constellation. Current Status: After being plagued with project overruns and a scaling back of the final system, the US military's next generation satellite communications network is another step closer to reality, with completion of the payload module for the third and final Advanced Extremely High Frequency (EHF) satellite. Although the EHF band is a relatively lightly used part of the electromagnetic spectrum (30-300 GHz), it is for good reason. Atmospheric attenuation is the biggest problem faced in this band, especially around 60 GHz, however the frequencies are viable for short distance terrestrial based communication links, such as microwave Internet and telecommunication links (which already operate in this band). Millimetre wave radar, probably best known as the radar that can see through your clothes but not your skin, also operates in this band. Designed to avoid problematic frequencies that are more susceptible to attenuation, but accepting increased overall atmospheric attenuation, are an increasing number of military and civil satellite systems that are using this band for uplink and downlink, as well as inter-satellite communication. Inter-satellite communication is really where EHF equipment shines (no atmosphere, small antennas, high data rates). Civilian systems are currently around the Ku band (Intelsat), providing data rates of up to 2-4 Mbps (14 GHz uplink, 12 GHz downlink) however these rates have still to trickle into everyday user's hands for remote and mobile Internet access. It is more common that an aggregator will access this link/rate and use that to then portion out local Internet access. Systems such as this are in use for remote Australian territories like Cocos and Christmas Islands, and formed the backbone of Boeing's stillborn Connexion in-flight Internet access. High ongoing access costs (basically a share of the overall cost of the satellite) and limited access slots help keep the technology away from everyday use at this time. Militaries and governments around the globe also lease access on these circuits when they need the added capability, with Intelsat and Inmarsat systems being used in the first Gulf War. Advanced EHF is designed to provide 24 hour coverage from 65 North, to 65 South across the K and Ka sub bands, and when combined with the prototyped Extended Data Rate (XDR) terminals and systems, will offer up to 8.2 Mbps data rates for around 4,000 terminals in concurrent use per satellite footprint (whether that scales to 12,000 systems in concurrent use globally isn't clear from source material). Within the tri-satellite constellation, inter-satellite EHF links will allow terminals on opposite sides of the globe to communicate in near real-time without the use of a terrestrial link. Combined with smaller, directional antennas and the various options for anti-jamming technology, it represents a significant military capability for the US. Already plans are being drawn up for the Transformational Satellite Communications System (T-Sat) which will replace Advanced EHF starting sometime in 2013, however it is already facing funding troubles. This could be problematic, with Advanced EHF still struggling to reach capability and the final launch not scheduled until April 2010. Dropping the fourth satellite of the Advanced EHF constellation has been planned to give the USAF time to implement T-Sat more rapidly. If GPS and remote imaging (think Google Earth) have proven anything, it is that technology initially developed for military purposes, and extremely expensive for initial civil use, will eventually reach the point where it forms part of our daily lives without us ever being conscious of the massive investment to get to that point. Metro Femtos another option for LTE. Around six months back, Unstrung article mentioned that Vodafone dreams of Metro Femto. Now Doug Pulley of picoChip s all set to champion this concept. In the recently concluded LTE World Summit, he said "The macrocell is dead. It's a fallacy to think you can reuse existing cell sites to get LTE services. That whole premise is broken." Both China Mobile and T-Mobile have said they plan to use existing 3G cell sites for their LTE networks. But Pulley contends a traditional macrocell deployment won't work because of the basic laws of physics. Here's the deal: "User throughput rolls off the further you get from the base station," says Pulley. "[With] increased throughput, the signal becomes more sensitive to noise and interference. The further it has to travel, the weaker it gets." So that means LTE cell sites need to be small and a have smaller radii than traditional macro sites to get the full data throughputs that LTE can offer, which will be up to three to four times higher than 3G HSDPA release 6, according to Adrian Scrase, CTO at the 3rd Generation Partnership Project (3GPP) . "You've got to have new sites, and the capex implications of that are potentially horrible," says Pulley. So future LTE femtos have to be cheap. PicoChip is developing a system-on-chip (SoC), code-named Feynman, that will enable a dualmode HSPA/LTE residential femtocell with a bill of materials of $70 in 2011. A lamp-post mounted, dualmode HSPA/LTE version of the femtocell will have a bill of materials of about $170. "This is orders of magnitude cheaper than doing it any other way," says Pulley. For equipment suppliers, though, the concept of small, cheap base stations, especially those that might supplant current base station models, is causing some tension, according to Pulley. T-Mobile is keen on LTE femtocells. "Femtocells [will be] an important measure to supplement LTE for indoor coverage and capacity scenarios," says Frank Meywerk, senior vice president for radio networks at T-Mobile. And China Mobile suggested that operators outside China could use the TD-LTE (Time Division LTE) version of LTE for capacity-enhancing femtocell deployments. That's an option for many European operators that, as part of their spectrum allocations for 3G UMTS services, have been awarded 5 MHz of time-division duplex (TDD) spectrum, along with their primary allocation of frequency-division duplex (FDD) spectrum. TD-LTE would be a particularly useful choice for operators looking to maximize coverage in dense urban areas, as such deployments would "not interfere with FDD spectrum," according to Bill Huang, general manager at the China Mobile Research Institute. "I've heard that without having fixed spectrum allocated to femtos, it's not possible to deploy femtocells" because of interference issues. Canada's Telus presented findings that femtocells do indeed have better performance in metro deployments. "We're all here today to determine if there is a performance difference with going with very small cells," said Sam Luu, associate director of technology planning and strategy at Telus. "There is a significant performance difference at the edge and at the site." But Luu cautioned that metro femtos are, for now, still only an interesting idea. "You can talk about technical better performance," he says. "But it still requires the R&D to get it off the ground. We're still in the early stages of evaluating the technology." I have mentioned here and here that Femtocells can be considered as starting point for LTE rollout. Thinking about all the posts, it may be a better that an enhanced version of Femtocell or Femto++ is used. By this i mean that traditionally HSPA/LTE Femtocells are to allow max. 4 calls (more correct would be 4 radio links because the users could be in multi-call with CS and PS connection ... I know there is no CS for LTE but I am talking about HSPA) simultaneously and the Femto++ would allow 16 calls simultaneously. In fact Huawei has a 16 channel Femtocell that is being trialled but not everyone is happy to refer to it as a Femtocell. A better term suggested is Picocell or my personal view is that depending on the power output, it could be classed as Femto++ or Picocell. Operators can also reduce the cost of rolling out Metro Femtos by encouraging users to keep the access open on their Femtocells open and giving them a reward for every originating and terminating call made on their Femto. LG recently announced that it has independently developed the first handset (user equipment) modem chip based on 3GPP Long Term Evolution (LTE) technology standards. The modem chip can theoretically support wireless download speeds of 100Mbps (megabits per second) and upload speeds of 50Mbps. This represents a significant step toward creating a market-ready 4G phone. LG demonstrated the chip at its Mobile Communication Technology Research Lab in Anyang, Korea, achieving wireless download speeds of 60 Mbps and upload speeds of 20 Mbps. The fastest phones currently on the market use HSDPA technology and download at a maximum speed of 7.6 Mbps. For the past three years, LG have been pursuing 3GPP LTE standardization, working to develop and test commercially viable LTE technology with approximately 250 of R&D staffs. The result is a 13 by 13 mm modem chip, perfectly sized for the next generation of slim-yet-powerful handsets. For its demonstration today, LG used a test terminal running Windows Mobile to play back high quality, on-demand video. In addition to this handset modem, LG is also developing the first preliminary LTE-based data card, which can replace the wireless cards currently used in computers. Mobile phone carriers have now built LTE test networks and are currently working on early stage handsets. The first LTE mobile phones will likely reach the market in 2010. If you remember, LG was one of the partners with T-Mobile and Nortel when they tested LTE some months back. Anyway, LG also caused a stir with this announcement because it boasted of having 300 patents related to the technology. The report, in Korea Times, caused ripples of nervousness because LG is not a participant in the patent pool that several large vendors formed last spring for LTE. The aim of this group is to create a cross-licensing framework, and sign up sufficient numbers of IPR holders, that it will achieve “fair and non-discriminatory pricing” amounting to a single digit percentage of the cost of a handset, and single digit dollars for a laptop, for all associated intellectual property, commented Arstechnica. Patent pools are gaining in popularity as new standards emerge with ever larger numbers of patents involved, but with rising pressures to be cost effective. The WiMAX community created the Open Patent Alliance earlier this year, and this week, the IEEE standards body struck a two-year deal with Via Licensing, one of the most prominent patent pool administrators. This agreement will create one or more patent pools for key IEEE communications standards, including Wi-Fi. The standards group believes this will help drive its specifications into the market more quickly because vendors will have greater confidence that IPR licensing will be fair and patents declared upfront before standards find their way into commercial products. There were some interesting discussions on IPR framework in the LTE World Summit that i will hopefully blog soon about. In the past few years text messaging has really grown especially with the young people like me although it’s a different matter I prefer to call instead of texting. It’s not a rocket science that texting is cheaper and sometimes keep people going on their mobiles and also it’s a way of passing time for today’s youths. I came across some interesting thing called txtForward earlier today, which I thought was worth a mention here. As its name suggests, txtForward automatically forwards incoming or outgoing text messages to a specified email address. Now this can encourage young people like me who find dealing with email quite easy than the actual texting on the phone. But at the same time this could be a boon for the heavy text user who might just want a simple and reliable way to archive their messages. And in case you didn't realize, text messaging is apparently being used by teens to avoid taking phone calls by their parents. How amazing, today’s youth like me are definitely one step ahead than the older ones. Anyway, the unfortunate state of affair is that most smartphones simply do not treat text messages as important, and hence are generally limited in terms of message-level searching, as well as in their backup and archival. Available for the BlackBerry and Windows Mobile, the BlackBerry version of the software worked flawlessly for me. Of course, the trial is limited to only 10 forwarded messages, so my experience with it is limited. One downside for privacy advocates is that the emails are sent out via Electric Pocket's servers, though the company gave assurance on its website that no logging, recording, or monitoring of messages takes place. In the last year as everybody knows because of the lack of money in the market situation has turned towards grimness. In these difficult times everybody tend to take measures whether right or wrong we can’t say for sure. One thing though which is sure is that everybody tries to cut cost in these difficult circumstances and hence results in the some unpopular decisions. Telecomm companies are no different than others and hence quite rightly taken stern steps towards cutting costs. There is some nervousness especially among the investors which gives an impression that spending in the wireless sector will be hot has as well. Although the certain trends and strategic vibes coming out of the major companies doesn’t suggest so for the time being. Infact I must say wireless infrastructure spending has overtaken wired in the majority of large enterprises. I can see the main reason behind this increased spending is that companies are well aware that majority of us like to have wireless these days. Majority of the companies, no doubt also expect all their networked equipment to be wireless enabled. This obviously presents a strategic view in front of the companies and investors as a need for mobility and hence the need to upgrade or replace an existing wired LAN. As everyday passes by in these hard economic times the budget is getting reduced and hence there is a sense of urgency to be more efficient. I might not be very wrong is say that at the moment wireless/mobility sector seems to be achieving that efficiency by taking certain calculated steps. 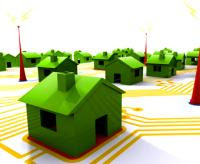 Companies are trying every possible bit to get the maximum out of the existing or newly planned wireless infrastructure and the technology as such. Once such company which everybody thought will say goodbye to Wireless is Alcatel-Lucent. In the highly anticipated strategic announcement by the newly appointed CEO of Alcatel-Lucent, Ben Verwaayen, has announced and hence strongly countered that it is committed to being a major supplier of mobile infrastructure. I guess Ben Verwaayen see that there is a huge potential in the wireless market and hence despite being pressured by some of its major investors he still wants to go ahead with the spending on the wireless infrastructure major being the LTE. In the last year whenever I spoke to my friends in different companies I got the view that everybody wants to cut the cost so that they can continue or maintain their R&D section. In my view this is the right thing to do specially for the giants of telecoms. It’s quite simple that R&D projects will enable to develop new and exciting products and hence the revenues. Based on the above information which gained by talking to different people at the top of the industry I’m 100% confident that companies like Ericsson, Nokia Siemens Network, Alcatel-Lucent etc will maintain its R&D resources and will be ready with LTE products when the market demands. It is very much obvious companies will focus in a more targeted way than in the past and thus may be putting LTE at the very centre of their efforts. The whole ideas to regain the market share and become a leading supplier within 18 months.